It’s not every day that a person gets the opportunity to be in on the ground floor of something special – something anointed – something Holy Spirit driven. About two years ago, the call went forth from the heart of Jenna Guizar: It’s time, her message seemed to say. It’s time to strengthen women in the Word. It’s time for us to seek and find Him. And each other. It’s time for building community. It’s time for Blessed is She. Although I’ve written recently about saying, “no” to various tasks, ministries, and projects, I don’t make it a habit of saying, “no” to Blessed is She. Why? You might ask. What makes BIS so special? Blessed is She is good. Not familiar with Blessed is She? No worries! Please take a moment to familiarize yourself – and perhaps even more importantly, sign up for the daily devotions – each day’s Scripture verses and a beautiful reflection delivered 365 days to your inbox – for free. Don’t worry – I’ll wait. Just when I thought things couldn’t get any better, they totally did. 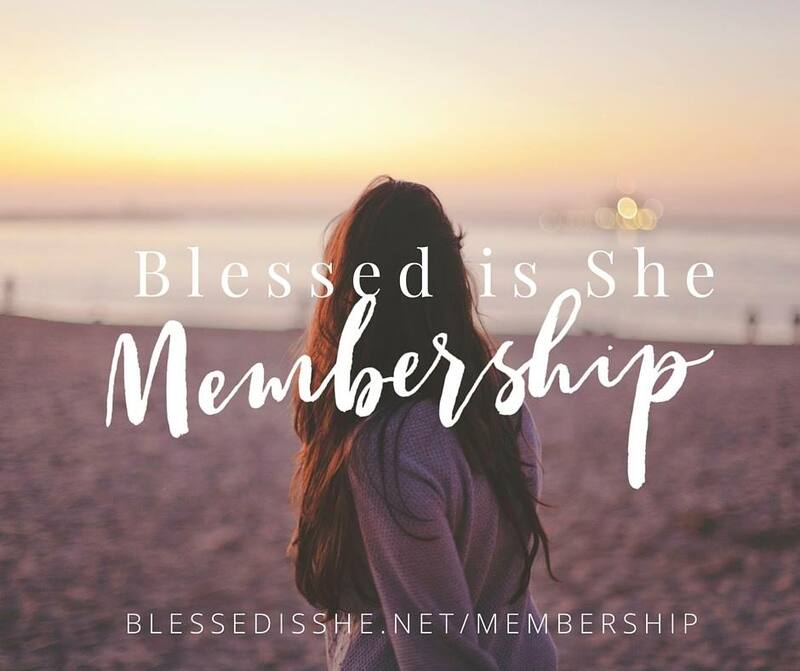 Blessed is She is proud to announce an amazing new membership option. Monthly workshops offered by speakers teaching on matters of faith, life, prayer, Church teaching, and more. My good friend and The Visitation Project Co-Host Bonnie Engstrom will be giving the next workshop, on Forming Intentional Community July 22, and I am on tap to give a workshop in the Fall – stay tuned! Priced separately, workshops are $15 apiece and journals are $20 each, so your membership fee of $9.99/month or $99/year means you’ll save at least $100 each year! If I seem a teensy bit excited about the BIS Membership option, well, it’s because I am excited! Women striving to learn, know, and live our faith, steeped in the Word of God and the love of Jesus is something I can get behind. I hope you will, too. Blessed is She has provided untold blessings in my life, and I can’t wait to dive into the latest offerings. Subscribe today, friends. I promise you won’t regret this “yes”! It’s most definitely almost summer in Oregon, and Mother Nature is just plain showing off. It’s days like these that just make me praise the Lord!! Perhaps it’s my Franciscan background. Annnnyway – here’s some stuff I want to share with you this week. Yes, indeed-y. 2. There’s still time to register for the upcoming Summer hotness that is Catholic Women Rejoice featuring Jennifer Fulwiler of Conversion Diary + the Edel Gathering, Catholic Evangelist Kelly Wahlquist, and yours truly. Seriously – this is a no-brainer, West Coast ladies (and Idaho/Nevada/Montana gals, too!). For less than the cost of dinner and a movie, you will enjoy a FABULOUSLY refreshing and inspiring time with other Catholic women. And I hear Edel is on hiatus 2016, so if you want to get your party on with Jen, register today. Seriously. You will thank me. I promise. 3. Lots of interesting things happening around the web these days. Here’s the best article on the web right now (IMHO) about the Caitlyn/Bruce Jenner situation. Written by Jenny Uebbing, it’s compassionate, smart, and 100% Catholic. Read on, friend. Oh, and speaking of brilliant, this week Simcha Fisher reminded me (yet again) why I love reading her articles with this piece at the National Catholic Register about why Church teaching will not – indeed, cannot – change. “Humanae Vitae. BOOM,” she writes. Boomshakalaka. The other thing you need to know about is the #WhyIRemainCatholic project … please check it out and participate when you can. I really, really want to. I am trying to come up with all the words right now. 4. I know this is, like, light years away in internet time, but I just recorded my first Building Bridges podcast with the unstoppably amazing Jenna Guizar (Blessed is She Guru, all around Queen of Awesome) and the indefatigable sassafrass Cristina Trinidad (Faithfully Social, etc. etc.). They were a blast to chat with, and I look forward to when my episode airs … in 2017. Just kidding. July 20, 2015. 5. What else have I been up to? 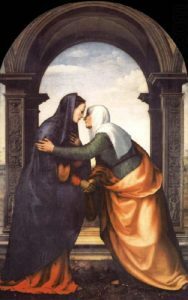 Oh – my latest article on Keeping the Spirit of the Visitation Alive was over at CatholicMom.com (check), RealCatholicMom was fabulously featured over at Catholic Sistas (check), I submitted my first article for Ignitum Today (not published yet, but check), I submitted my first for New Evangelizers (also not published yet, but check), and am working on my first article for LovesChoice.com (an adoption site), and my second article for Catholic365 (here’s my first). And I haven’t even mentioned the other podcast I need to submit to – STAT! before they “unannounce” my affiliation (gak!) – and the 5,000 words that are due at the end of the month … Woof. like I said: summer’s almost here, and the living is BIZZZZZY. 6. And … shoot me now … I honestly cannot remember what #6 was going to be. Oh! I know. I am so blessed to be an affiliate for Organic Mama’s Shop. Shannon has GREAT stuff, y’all. Just the best. And, if you click through my link to order her amazing wares, you help support this woefully underfunded writing habit I posses. #bonus!! Help support the #RCMBlog. Please and thank you so much. Please. 7. And now, without further ado, the cutest picture I took this week. Where we live, spring can be confusing. It was 88 degrees this day, but the next it was in the high 50s and rainy. Some may call my son silly – I call him a prudent prophet. Linking up with the super cool Kelly at This Ain’t the Lyceum. I would challenge her to a dance-off, but I’d totally lose.